BITPAL participated in the activities of the Palestine Technology Week Expotech 2017, during the technical session entitled "Enhancing creativity and innovation in the development of IT curricula in Palestinian universities". Dr. Ahmed Abdel-Al, project coordinator at the University College of Applied Sciences (UCAS) explained that the BITPAL project aims at developing eleven academic programs in three levels in computer engineering, computer science, programming diploma and multimedia diploma, including training of Academic staff, providing innovation centers within partner universities, and supporting students and graduates through providing opportunities to incubate innovative ideas and projects in the field of information technology. This session aims to introduce the project goals and activities to the Palestinian academic institutions and how to benefit from it. Dr. Alaa Al-Halees, a representative of the Islamic University of Gaza (IUG), talked about how to identify the needs and priorities of the IT sector as well as identify the skills that the labor market needs to be available in graduates of IT programs. Whereas Eng. Alaa AkKila talked about training missions which were held in European universities in Italy and Germany for developing academic staff in topics related to the curricula development and incubation process. On the other hand, Dr. Mohamed Awadallah, a representative of Al-Aqsa University, provided an overview about the methodology of developing the curricula in accordance to the accreditation and quality standards in the Ministry of Education and Higher Education, including new skills as well as the latest international studies in this field. Eng. Lina Shamia, Regional Director of the Palestinian Information Technology Association of Companies (PITA) talked about the role of PITA in establishing a framework for the network of professional competencies to enhance networking and the relationship between the private sector and academic institutions. 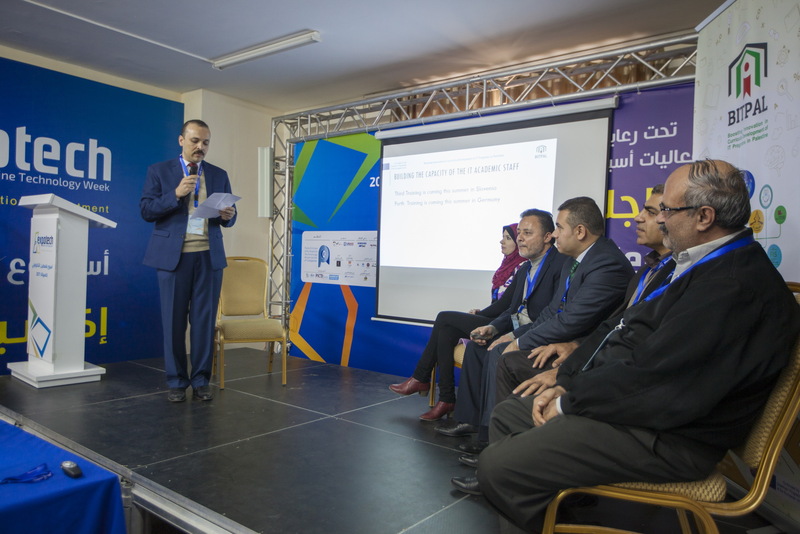 Dr. Ibrahim Sukkar, a representative of Gaza University (GU), addressed the mechanisms of producing professional training materials as well as training and incubation opportunities, which will be provided later to serve students and graduates. It is worth mentioning that BITPAL project (co-funded with support from the European Commission under the ERASMUS+ European programme) is managed by UCAS in partnership with three European universities: HTWK Leipzig, Germany, University of Calabria, Italy, and the FIS of Slovenia. In addition to four local Palestinian universities in Gaza Strip: The Islamic University of Gaza (IUG), Al-Azhar University (AU), Gaza University (GU), and Al-Aqsa University (AQU).